A visit to a smokehouse is a must when in Bornholm. A smoked herring is a classical Bornholm delicacy. The history goes that Scottish soldiers, that were deployed to Christiansø in the first half of the 19th century, were the first to smoke fish. From here the process of smoking fish came to Bornholm, where the first smokehouse was established in 1866 in Gudhjem. From here the process of smoking fish and the etasblishing of smokehouses came to the whole island. At one time there were so many small and big smokehouses in Gudhjem, that the town was named “the 100 chimney’s town”. Today there are 10 smokehouses on Bornholm, that still are working. All over Bornholm you will see smokehouses with their traditional chimneys. They are typically combined with both a restaurant and a shop. The Bornholm smokehouses still produce delicious smoked herring, which many say is the true taste of Bornholm. Smoked herring is a traditional Bornholmian dish, so you must try “Sol over Gudhjem”, a smoked herring served with a raw egg yolk, radishes, spring onions and rye bread. Other dishes to try include the Bornholm salmon, cod, halibut, mackerel, eel, trout, prawns and other smoked products – they are definitely worth a taste! Read also about the Chef Competition “Sol over Gudhjem”. Smoking at the Bornholmian smokehouses is done by hanging herrings or other smoked products on grills or spits over alder wood. 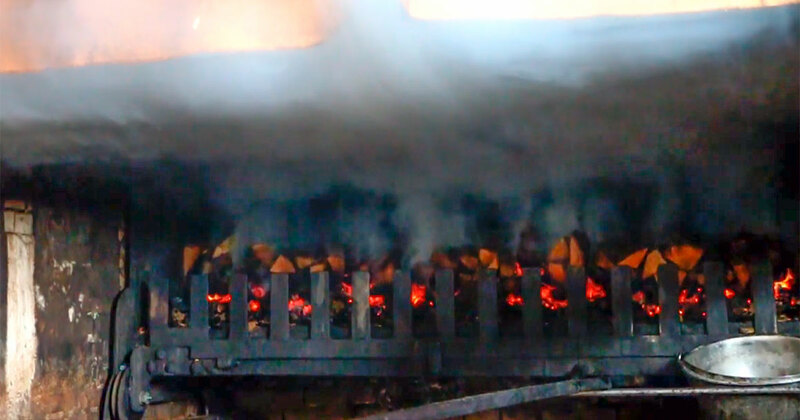 The smoked products are placed in a chimney, which is why you will see the large open chimneys at most smokehouses. The main rule of smoking is that there must only be embers, which is why the smoking is constantly monitored. First the fish are dried over open flames for about two hours, whereafter the flames are extinguished and the fish are smoked in the thick, light grey smoke for another two hours. Many of the smokehouses on Bornholm open around Easter and are open until after autumn half-term.